Could you make a version in plain .xls format? OpenOffice can't read .___x files without severely mangling them. Note that cut-and-fill construction, i.e. excavating a shallow trench and using the spoil to construct a low berm to either side, minimizes earth moving cost and also provides effective protection against noise and vibration. Unfortunately, it's only feasible where sufficient ROW width is available and regular overpasses are acceptable solutions for cross roads. Related: even mini-berms, 3-4 feet high, with stabilized 45 degrees slopes on the track side and located as close to the tracks as the loading gauge will permit, will do a very good job of deflecting rail-wheel noise skyward. This concept is compatible with alignments at or slightly below grade, such that deep underpasses can be used to grade separate cross roads. Another source of railway noise are mechanical brakes, especially older designs based on cast iron brake pads. Modern alternatives use polymers (standard speed) or internal ceramic disc brakes (HSR). Either way, the low surface roughness of the rail-wheel interface is much less or not at all compromised by braking. In Switzerland, retrofitting the brake pads on the legacy passenger train fleet has resulted in noise reductions of 10-15dBA (pass-by noise at 80km/h measured at head height and 7.5m distance). The values can be 5dBA higher if the rails are rough. Source (in German). See PDF p4. Just to be clear: the above information is not related to the noise generated when the mechanical brakes are activated (i.e. electric recuperation or rheostat braking are insufficient). Rather, it relates to the indirect effect brake pads have on the surface roughness of the wheels and via a second level of indirection, that of the tops of the rails. 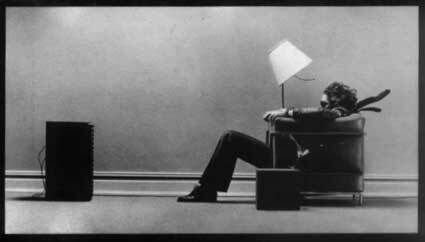 Check this for a good way to decrease noise by 3-7 dB sans sound walls etc. Even 3 dB would make an enormous difference. another good idea. Unfortunately, combining multiple mitigation strategies never yields quite as much improvement as you'd hope for: the aggregate noise reduction is almost always less the sum of the individual results. Btw: the newsletter discussing the effect of switching brake pad materials also included a separate interview with s Swiss homeowner whose property abuts a railway line where SBB/CFS had recently installed a tall sound wall. He wasn't crazy about that, saying it blocked the view in his garden and wasn't all that effective. On the other hand, installing soundproof windows greatly reduced indoor noise, which was more important to him. The Swiss federal government paid for half the cost of the window upgrade, but he would have preferred that the money spent on the sound wall had been invested in higher subsidies for the windows instead. He also mentioned that neither measure had any impact on the vibrations generated by passing freight trains. @Alon, working on it... fighting Excel because the conversion to .xls breaks some formulas. I need to figure out why. Some of the conditional formulas are very long and that may be part of the problem. @Peter: 3 dB is a huge difference, but barely perceptible to the human ear. We have 3 dB of calibration error. I'm curious how effective the Silent Track technology would be on slab track. Every little bit helps and can add up beyond its little mitigation contribution. In North Central San Mateo we've noticed a change with the raising of the Caltrain horns. Noise near the tracks seems lessened, while people farther away are hearing it. It appears that this spreadsheet doesn't account for the change in height of the tracks. Also in connection with height change, to use this correctly do I have to sketch a vertical section from the tracks to determine if a building is between the 20+ft high train and my ground level house? And last some comments seem to indicate that "berm" is unlike the berm we have here in San Mateo with a wider footprint that might mitigate noise better. I'd be interested to see what spreadsheet considers a berm to be. I think the berms discussed in the comments are berms used to block sound, with the tracks located on the opposite side of the berm from the receiver (you or your house), not a berm where the tracks are located on top. After the long and drawn-out Caltrain horn fiasco, the horns returned to the same location where they started. So in the end nothing has changed. The spreadsheet accounts for the height of the tracks in cell A27. It only does so crudely, according to the FRA method for the initial assessment. See the FRA guidebook page 4-9... they call it "embankment" but I called it "berm" because that seems to be the lingo here on the peninsula. A detailed impact assessment requires in-situ noise measurements. Your neighborhood might consider paying for such measurements, as ammunition for when the project EIR comes out. I would like to add that Japan's findings seem in keeping with our own findings for sound wall height requirements near residential neighborhoods along 101, which are, I think, 14' in height. @Ted, according to a full technical brief provided by the Japanese to the CHSRA, the Japanese sound walls are 6'6" (2 m) tall above the rail. In some locations they are 10' (3 m) tall but then the top 1/3 of the wall is a transparent panel. These are used for very high speeds, significantly greater than the 125 mph peninsula dawdle. I'm pretty sure that 101 is a heck of a lot louder than 300 electric trains per day... there must be material out there on how many dBA you get from a ten-lane freeway. For example, the Federal Highway Administration's Traffic Noise Model, which costs $695. Ka-ching. As a random data point, the San Carlos Transit Village DEIR noise study finds that a location 35 ft from the center of El Camino Real is somewhat louder than a location 20 ft from the Caltrain tracks. Both locations have a peak Leq(hr) of 72 dBA, in the "very noisy urban" range. Yikes. @Alon, please try it in plain .xls format and let me know if it works for you in OpenOffice. I have a question: what parameters do I put in if the suburban area in question is separated from the tracks by a freeway? On another note, the calculator is at times broken. Try inputting the following variables: 220 feet from tracks, 2 rows, category 2, urban; existing traffic electric, 1,020 feet with 85 feet leading locomotive, traveling at 120 mph, with 15 tph peak, 150+50 tpd, on viaduct; new traffic #1 as above but 110 mph, 12 tph, 100+30, and #2 1300 ft EMUs with leading unit 85 feet, traveling at X mph, 10 tph, 200+30 tpd. As you increase X, the impact increases, until you have X > 170. Then suddenly the impact meter jumps back down. Could you explain? At 170 mph, the model transitions from speed regime II (dominated by rolling noise) to speed regime III (dominated by aerodynamic noise). Speed regime II is adjusted by the length of the train, since rolling noise emanates from the entire length of the train. Speed regime III is adjusted by the length of the leading car, since aerodynamic noise is dominated by the front end of the train. Depending on your selection of train length and first car length, there can result a discontinuity in the source intensity at 170 mph. For more information about the speed regimes and respective equations, refer to the FRA guidebook. You can get insight into the internal workings of the model (what speed regime is selected and how the train length adjustments are made) in the 'Intermediate Calculations' tab of the spreadsheet. Not that any of this will matter here on the peninsula: we are firmly in speed regime II. They have older versions of the highway noise models available. please try it in plain .xls format and let me know if it works for you in OpenOffice. The .xlsx file opened for me in Open Office but only after clicking on the warning message about macros not working. Since you wrote that it did not contain any macros that tells me something was up. How ugly that something is, is difficult to determine. The .xls file open without any complaints. YMMV depending on the version of Open Office and the OS your computer is using. Define the freeway. An Interstate grade lane is 12 feet wide. Some highways aren't up to that standard. ( The Pulaski Skyway, the Merritt Parkway, the West Side Highway/Henry Hudson.. come to mind. ) Is it two lane? Or 6 lane in each direction. Is it lightly traveled or at capacity 18 hours a day? Noise barriers for the freeway work on both sides of the noise barrier... Except for lightly traveled narrow freeways the impact of the train(s) is going to be "imperceptible" or "less than background" or something equal to "What train?" No, it's not rhetorical. And the freeway I'm thinking of is I-95 through Cornwells Heights. It's elevated and has 6 traffic lanes, shoulders, and a median that could fit 2 more lanes. ...Cornwells Heights.. Think outside the box a bit. There's a really long really straight ROW between New Brunswick and Wilmington in the median of the NJ Turnpike. Put the super expresses out there and leave the four tracks of the NEC to regional and commuter services. You know, Adirondacker, I could reply here but there's a magnificent thread on TTP for this. Clem, My first post didn't take for some reason, thus the "I would like to add...". What was missing is what the HSRA reps have been telling people in workshops and that is that the sound walls don't need to be any more than 3-5' tall. I don't know that I believe this. Sound wall height is dependent on track width for one. According to the Federal Highway Administration (FHA): Studies have suggested that to avoid a reduction in the performance of parallel reflective noise barriers, the width-to-height ratio of the roadway section to the barriers should be at least 10:1. For comparison, per FHA, levels of highway traffic noise typically range from 70 to 80 dB(A) at a distance of 15 meters (50 feet) from the highway, while the 2006 FRA study had 125 mph HSR firmly in the 90+ dB range at 100 feet. I have read HSR sound walls in Japan are as high as 12', so I believe your numbers (6'6" - 10') are more likely to be realistic even for lower speed trains based on our highway standards and based on an 80-120' wide HSR system. My point is if the HSRA folks are not being realistic, these could result in some real eye sores on an elevated structure, even if the top 1/3 is clear. What are you referring to when you talk about dBA? Are you talking about Lmax, Leq, SEL, or Ldn? The "125 mph HSR firmly in the 90+ dB range at 100 feet" refers to SEL, I presume, since that is what the chart with Acela at 92-93 dBA @ 125 mph refers to. I'm guessing, without knowing the document from the FHA you're referring to, that the FHA is talking about Leq or Ldn. A large truck going 65 mph or a motorcycle going by would easily bust the 92-93 dBA SEL, but Leq or Ldn would not change very much from one event. Comparing the different noise descriptors is a true apples and oranges problem. You have to compare SEL to SEL, or Ldn to Ldn. The noise study you refer to also states that in Speed Regime II, "Wheel-rail noise typically dominates the A-weighted sound level at speeds up to about 160 mph." In that respect, that would explain how they can use relatively low sound barriers, as that would be all that is needed to decrease the noise caused by wheel-rail interaction. @Ted, yes sound walls can be eyesores, and I'm pretty sure they would be taller than 3-5 feet. But there are examples around the world of well-executed clear sound walls, for example in Prague. Czech out the photo gallery. The Nove Spojeni project also features a scary four track viaduct. Peter is entirely correct: be very careful when comparing dB's. The decibel is just a ratio, and if you're not using the same basis (e.g. SEL vs. Leq(hr)) then you simply cannot compare directly. 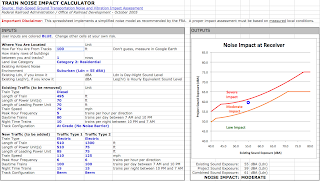 A conversion is required, which is included in the noise calculator spreadsheet. For a nice introduction to the differences between Lmax, SEL, Leq(hr) and Ldn, please read chapter 2 of the FRA Guidebook. I'm jumping in late with regard to freeway noise. Caltrans recently did a noise survey for the I-10 just east of Los Angeles (between 710 and 605 freeways). That section of freeway is 6 lanes in each direction and also has a single-tracked Metrolink train running down the center median. Most of the sites it monitored are behind 14 foot sound walls. 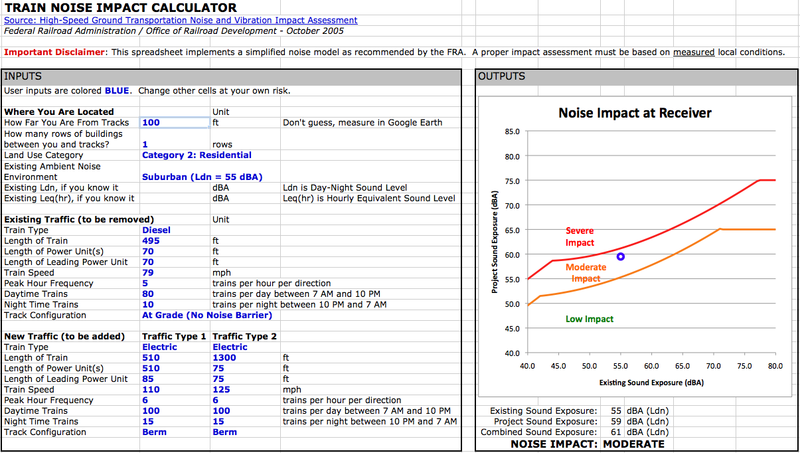 According to the Caltrans summary: "[t]he existing ambient noise levels measured were between 55 and 73 decibels (dBA). 15 long-term (24-hour) noise level readings were conducted to determine the noisiest hour within the project limits. The community background noise levels were taken at 4 locations within the project limits and ranged from 50 to 54 dBA-Leq(h)." Clem, is there any chance you will include freeway noise info in your spreadsheet if you are given the necessary data? I probably won't have time to expand to freeway modeling, but anyone who develops a detailed understanding of the math and understands Excel should be able to do it. There are a lot of comments and explanatory notes embedded deep in the guts of the spreadsheet. Have at it! As for evaluating the impact of adding HSR to the freeway / Metrolink mix, that's just a matter of dialing in the correct existing (pre-HSR) noise levels. The report you link seems to indicate 10-minute Leq in the high sixties and low seventies, which is pretty darn loud to begin with. Considering that the trains will be constrained to reasonably slow speeds by the curvature of the freeway, I doubt HSR will add much. The spreadsheet can tell you that. Interesting stuff. I'd add to your noise/vibration mitigation consideration: TOR and GF friction management have been shown to have a significant effect on curving dB and peak wheel squeal noise (http://interfacejournal.com/archives/1306). These high freq peak dBs are typically the sounds that generate public complaints. People tend to think of offensive rail noise as intrinsic rather than symptomatic -- but it's fixable.